You thought you found love, but you found a sociopath. You were burned — badly. Your ex is gone now, still, you hesitate to try again. Your reluctance is understandable. But don’t give up! It is totally possible to find a shiny new romance, even after a nightmare experience. 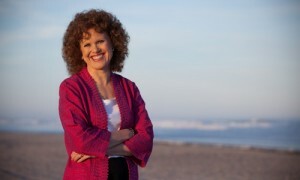 In this webinar, Donna Andersen, author of Lovefraud.com, tells you how. Once you’re feeling centered — and Donna explains how to know when you are sufficiently healed — there are approaches and strategies you can employ to protect yourself from becoming involved with a scammer or exploiter again. 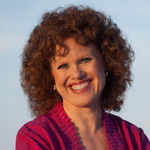 Donna Andersen explains the warning signs of disordered behavior, how to check out prospective partners, and how to know if someone who seems to be doing nice things for you is faking it. Yes, millions of sociopaths live among us. But far more people are not disordered. In this program, you’ll learn to distinguish those who are capable of love from those who are not, so that you can find a kind, loving partner. Even after the pain you endured, real love is possible. In fact, because of what you went through, your new love could be better than you ever imagined. 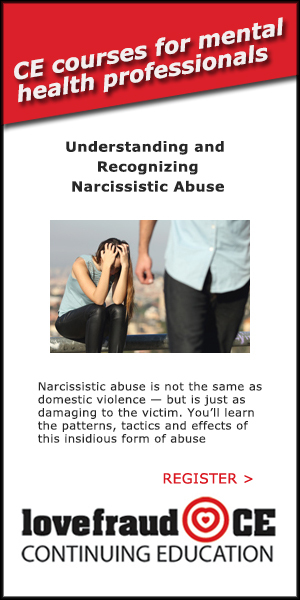 This webinar is part of the Lovefraud Understanding and Recovery 5-part Masterclass. Save when you purchase the complete program! Donna has collected more than 10,000 cases of people targeted by sociopaths, and has conducted eight Internet surveys of survivors. She has presented her research on sociopaths to the Society for the Scientific Study of Psychopathy. Donna is the program administrator for Lovefraud CE, which offers continuing education about personality disorders for survivors and mental health professionals. The cost for this course is only $25 for 60 minutes of instruction, plus 10 minutes of questions and answers. Once you purchase the course, you can access it online as long and as often as you want. All Lovefraud webinars are 100% guaranteed. This course is available as part of the Lovefraud Dating Recovery Bundle, along with the webinar Why it’s so hard to get over loving a sociopath and how you can recover. You also have the option to add on a 1-hour personal consultation with Donna and save $25. 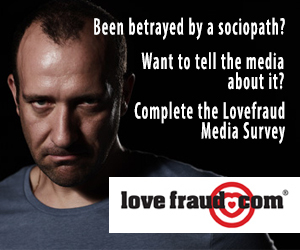 More information on the Lovefraud Dating Recovery Bundle.